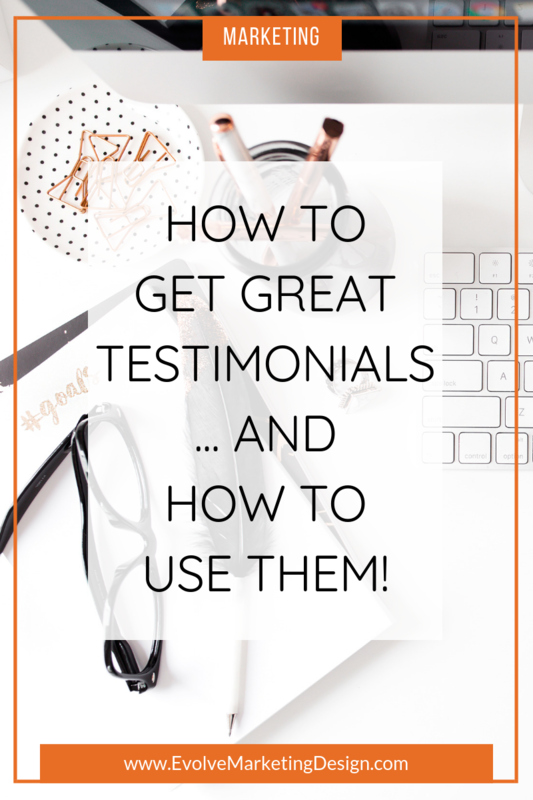 How to Get Great Testimonials … And How to Use Them! If testimonials aren’t a part of your marketing plan, make them a part of your marketing plan. Now. You’ve probably heard that all purchases—from a car to a pack of gum—are emotional decisions. As a business owner, you’ve got to engage potential clients on that emotional plane. One of the best ways to do that is to build your “know, like and trust” factor, since people are more willing to listen to and do business with people they know … or feel like they know. And one of the fastest and most authentic ways to build that know, like and trust factor is through testimonials: glowing reviews of you and your work from real-life people. The marketing term for this is “social proof.” Testimonials help build that social proof, even if your potential client doesn’t know the person making the testimonial. One survey found that 85 percent of consumers trust online reviews as much as personal recommendations. Testimonials are kind of like references on a resume: you may never actually call them, but it’s somehow reassuring to see them written down. It says you’re a real person who’s worked with other real people. You’re even possibly semi-normal. It calms something in your potential client. You can probably think of five or ten current or past clients who, if given a nudge, could give you a testimonial. But you don’t want a testimonial. You want a great testimonial. You want a success story. And, since most people don’t write marketing copy, we cannot expect our clients to give us a great testimonial without guidance. Not to mention, you may run into clients who say they don’t have time, or don’t know how to write a testimonial. Make it easy for them. This is your work, your reputation and your marketing. Therefore, you need to guide your clients in giving you a testimonial. Don’t leave it to chance. Make it part of your off-boarding process. As a client’s project wraps up, send them an email asking them for their success story aka testimonial. I’ve created a swipe file with sample language for your email and other tips; click the graphic below to download it. Use the complimentary parts of a client’s email. You’ve probably received a letter or an email from a client with a glowing comment about you and your work. Thank them for the message—didn’t it make your day?—and ask them if you could use it as a testimonial. I’ve never had a client refuse. Ask them to write it down. If you’re on a call with a client, or in a meeting, and they say something that sounds like a great testimonial, literally ask them to write it down and sign it. Thank them, let them know their trust means the world to you, and you’d like to use their kind comments as a testimonial. Always be clear that you will be using their words, their name and, if they agree, their headshot and website URL on your website and other marketing pieces. Most people have no problem with this, but if your client works for a corporation, they may need to get their legal counsel to sign off on using their company name in a public way. Of course, if a client refuses to give you a testimonial, that’s okay. Don’t press. You might not like what you hear. You must edit your clients’ testimonials. Seriously. Do not put a 500-word, paragraph-less block of text on your website! No one is going to read it. It has no marketing value. Instead, choose the best parts of what your client sends back to you and create one or two short, results-based testimonials. Snippets, sound bites … whatever you want to call them, you want them short, snappy and to the point. Really I could break that up into three short testimonials for something like a brochure, where space can be limited. As you can see, keep testimonials short—one to three sentences max—and make sure they say something about a transformation or success you helped them achieve and/or how awesome you are to work with. For years, web designers would create a separate page dedicated to testimonials, calling it something clever like “PRAISE” or “ACCOLADES” in the menu bar. Personally, I like to see testimonials peppered throughout a site, not clumped together on one page. The chances of someone reading a testimonial are far greater if it’s on the same page they’re already reading. If you ever struggle with what to post on social media, browse through your testimonials and create a post for each one. Then, schedule them out a couple of weeks apart. Voila! Less posts you have to write from scratch! Now it’s time to take action! Download the Swipe File and email five past clients today, asking for a testimonial. You’ll be so glad you did! I’d love to hear how this works for you. Please leave a comment below or head over to the Facebook page and leave a comment there. And, if you found this article valuable, won’t you please share it using the buttons below on your favorite social site? I’d appreciate it!